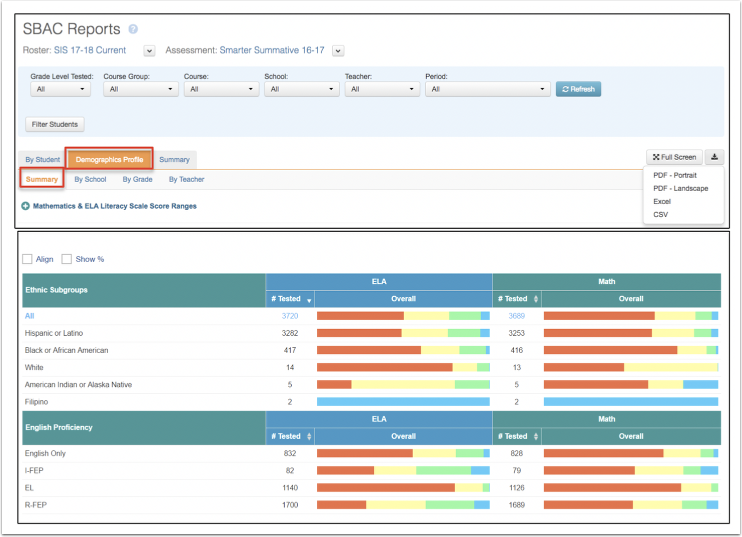 Once Smarter Balanced results have been uploaded into SchoolCity Suite, the data can be viewed and analyzed by using three SBAC Reports. The SBAC By Student Report displays overall student performance data as well as performance in each claim area. The SBAC Demographics Profile Report displays subgroup performance data by School, Grade, and Teacher (depending on User Role). 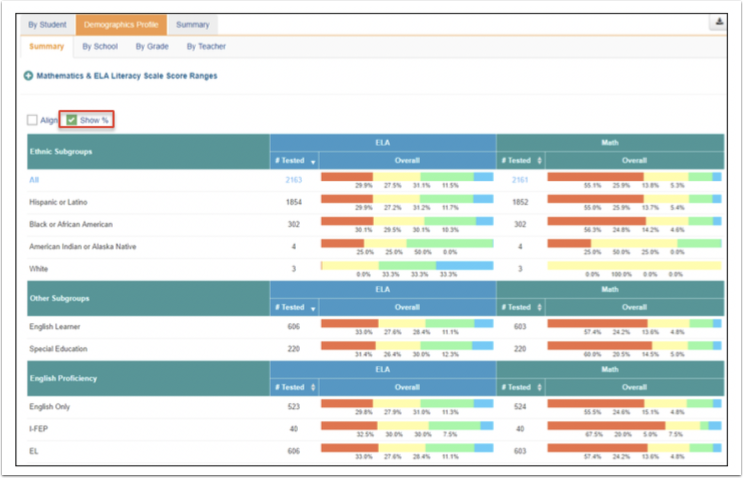 The Summary Report displays overall performance or claim performance by School, Grade, and Teacher (depending on User Role). This document will review the SBAC Demographics Profile Report. From the Top Menu Bar, select Reports, then click on the SBAC tab to view the reports. Or, from the Launchpad, click on the REPORTS flip card. On the flipped side, click on the right arrow at the bottom, then select SBAC to go to the reports. Search Filters: Types of search filters depend on user role. Click Refresh to view results of search. Mathematics and ELA Literacy Scale Score Ranges: Click on the green circle to open the tables. Align: Align displays the performance levels below and above proficient (See below). Show %: Show % adds the percentage of students in each of the performance levels (See below). Ethnic Subgroups: Disaggregates results based on ethnic subgroups according to the District SIS for ELA and Math. English Proficiency: Disaggregates results based on English Proficiency for ELA and Math. Align: Check the box next to Align to view the Overall results with the percent of students below proficient (red and yellow bars) and above proficient (green and blue bars). Uncheck the box to close the alignment view. Show %: Check the box next to Show % to add the percentage of students in each performance level. Uncheck the box to hide the percentages. Click on the green circle with a plus sign to open the tables. Click on the orange circle with a minus sign to close. 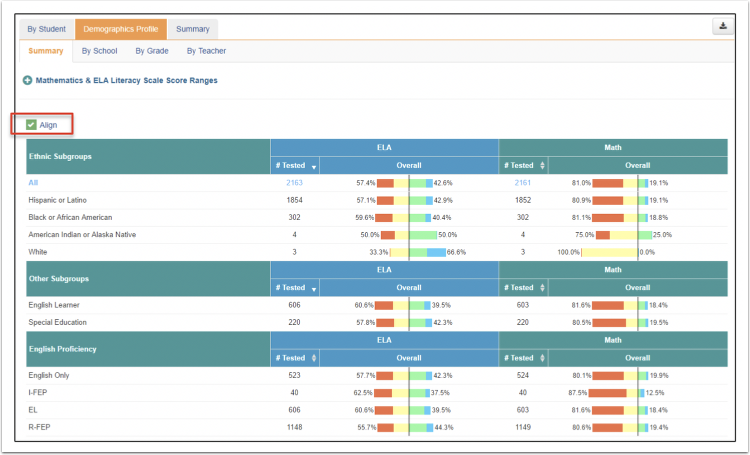 Demographics Profile By School: Results for each subgroup is displayed by School. Demographics Profile By Grade: Results for each subgroup is displayed by grade level. Demographics Profile by Teacher: Results for each subgroup is displayed by Teacher. More: Click on More to expand the list and view results for all teachers.